“I couldn’t believe it. No one had ever done that for me before. I was having a conversation with a venture capitalist who said ‘you have to meet so-and-so’. He immediately turned and picked up the phone to call the person while I was sitting in his office,” said Karen, a food industry executive and dear friend from HBS. “I didn’t really know this guy. His wife and I connected one day during pick-up at our children’s school. She said ‘you have to talk to my husband’ once she understood my status.” Karen was sharing the positives – the surprises if you will – of transition after having navigated two unexpected transitions within five years. For Novofemina devotees the Voices of Transition column is my attempt to introduce new ideas into my transition process. For this interview I chose a dear friend – offering the dual purpose of helping me with the blog and of connecting me with a friend who lives in far-away Dallas. What a Thanksgiving treat for me! Karen is no shrinking flower. She holds an undergraduate degree in industrial engineering from Stanford and an MBA from our august Harvard. Yet – she was honest and humble enough to say that transition is hard… but also oddly worthwhile, a source of inner strength and – if I was listening carefully – life changing. Karen shared three lessons learned about her transitions. We’ve heard this broad networking challenge again and again. This Summer’s Book Review #4 Back on the Career Track, by Fishman Cohen and Stein Rabin, introduced “contact pools” and challenged readers to map relationships from work, volunteering, alumni networks, children’s schools, religious affiliations, etc. (Back on the Career Track, pg 110) Their approach cast a wide net, including the butcher, the baker and the candlestick makers’ wife who has her own business and could be useful. Lesson #3: Build your stories. In Karen’s view stories give you ‘street cred‘ when you are networking. This isn’t a verbal resume exercise. It is an engaging narrative that illustrates the unique value you bring — to the situations you care most deeply about. “Make it real for your listener. How do you deliver value?” said Karen. Whether your story hails from volunteering, child rearing or divesting a corporate division, it is worth telling if it’s in your own voice and meaningfully conveys who YOU are. This Thanksgiving I am incredibly thankful for the wisdom of friends. I have never been more convinced that it is our connections with others that will take us beyond that which we thought possible. I am especially grateful to the connection with each of you. As I hope Bill Gates said with great sincerity to his mom for many years, Happy Thanksgiving. 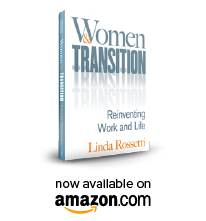 This entry was posted in Voices of Transition and tagged career transition, observations from a women's transition, women's transition issues. Bookmark the permalink.